Are you an avid fan of anything that involves Vampires? I have been addicted to watch a lot of movies and tv series involving them. This week, the last franchise of the Twilight series premiered all over the world. And it will be shown officially in our local theaters on November 19! eeeeeehh, I'm so excited! 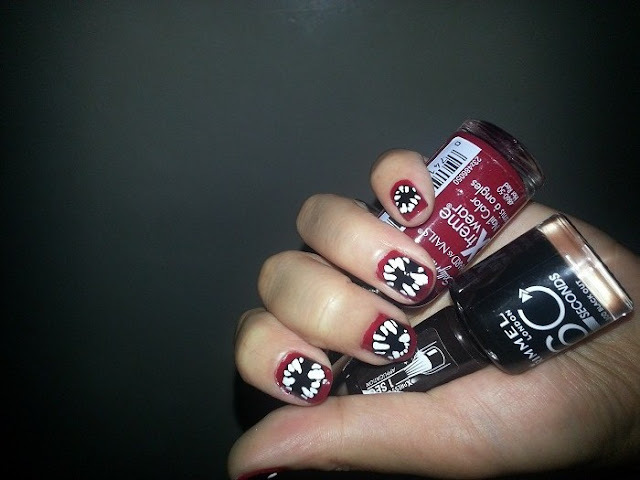 But before watching the movie, I'm going to paint these vampy inspired nails just to add more excitement! Follow these three easy steps to achieve a nasty cute looking nails. STEP 1. Get these nail lacquers; red, black and white. Prep your nails by applying your base coat. These will protect your nails from getting those yellowish discoloration. STEP 2. Paint your nails 2 coats of your red lacquer and let it dry. Once dried, get your black lacquer and create a big dot on the center of your nail beds. Please make sure to show some red color on top and bottom of your nails. This will serve as the vampire's lips. STEP 3. Get your white lacquer, and create vampire teeth. To do this, just create small lines, then for the actual vampire teeth create a slightly longer lines. It's easy, simple and very fun to create. Snap a picture of you and your nails on Twilight posters outside the theaters and don't forget to tag us.